A foot X-ray is often necessary to properly diagnose ankle sprains, fractures, and other athletic injuries that affect the foot and ankle. 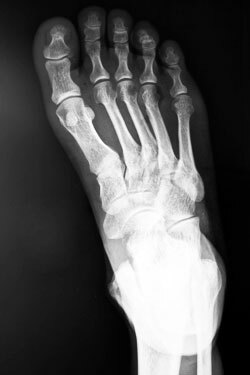 Unfortunately, many podiatrists’ offices lack X-ray machines, which forces patients to visit the emergency room or a diagnostic imaging center, only to return to their podiatrists’ offices once the foot X-ray has been taken. Dr. Mukesh Bhakta, D.P.M. at Prince William Foot & Ankle Center, PC and South Riding Foot & Ankle Center understands how frustrating this can be, especially when the patient is experiencing pain and discomfort as a result of his or her injury. That’s exactly why Dr. Bhakta is proud to provide digital X-ray services right from the convenience of his office at Prince William Foot & Ankle Center in Gainesville, VA. The foot X-ray services provided at Prince William Foot & Ankle Center aren’t only convenient because they’re provided in-house, but are also beneficial because they’re taken digitally. This enables Dr. Bhakta to instantly view the bones in the patient’s foot and ankle. Traditional X-rays, on the other hand, can’t be utilized by a physician until they’ve been developed. Once Dr. Bhakta has viewed a patient’s ankle and foot X-ray, he can then develop a treatment plan that best suits that patient’s lifestyle. In some cases, the symptoms of foot and ankle injuries can be abated with over-the-counter medications and compressive bandages, while others may require surgery. Those who need to undergo an operation are often relieved to learn that they’ll have a familiar face in the operating room because Dr. Bhakta performs his patient’s surgeries himself. If you or a loved one has sustained an injury that may require a foot or ankle X-ray, click here to schedule an appointment with Dr. Bhakta at Prince William Foot & Ankle Center. We’re conveniently located for patients in Manassas, Catharpin, Centreville, and surrounding areas.